Art Walk is always more than Art exhibits — it’s Happy Hour specials, meal deals and unique experiences. 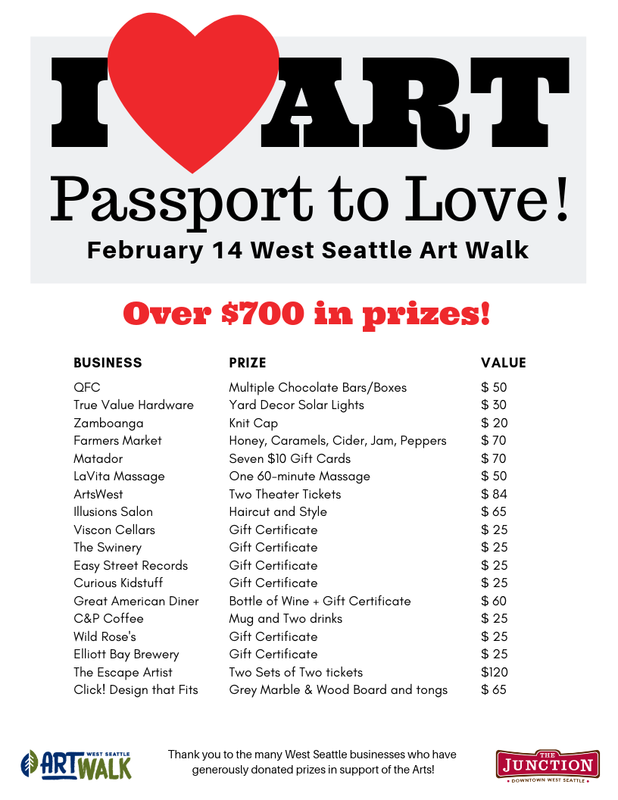 And in February, the Valentines Day Art Walk also means Prizes! For the first time, the Art Walk will feature a special “Passport to Love” for art lovers to use to see great art and win local prizes. Fill up your card with stickers and fill in your contact info. How do I enter to win prizes? To be entered to win, drop your passport either the night of Art Walk, or before Saturday, February 16, 3pm, to be eligible for the drawing on Monday, February 18. Winners will be notified by the contact information provided. Our local West Seattle businesses have donated fabulous prizes, currently valued at over $700! We will update this hot sheet as more donations are received — check back often before Valentines Day. Big thanks to our generous donors for their support of the arts! How do I get a Passport to Love? No purchase is necessary to receive a sticker, even at the restaurants or bars. Just say hello and say you are here for the Passport to Love! One Passport to Love per person, no age restrictions. Passports must be in the dropboxes no later than 3pm, Saturday, February 16. The West Seattle Junction Association will not use your name or contact information for marketing purposes.